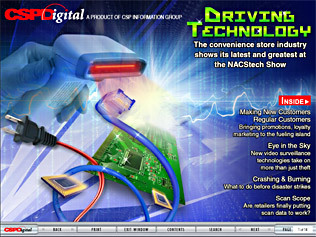 CSPDigital's latest issue provides an up-close look at this year’s NACStech Conference. Read on-site coverage of educational sessions, including exclusive video interviews and audio clips, as well as a photo album with pictures from the tradeshow floor. Merchandising at the Fuel Island: How retailers are convincing fuel-only customers to shop their stores through dispenser coupon printers and loyalty programs. Security: Video-surveillance systems offer more than just a deterrent to crime. Today, video cameras and digital video recorders have a role in merchandising and operations. Planning for Disaster: Hurricanes? Fires? What to do when disaster strikes and – more importantly – how to keep your company up and running in the event of one. Scanning Data: After years of talking about the benefits of point-of-sale scanning, the convenience channel is beginning to make the most of it.